Although specialising in Asians now, that was not originally Liz's intention at all. Rather, she wanted a Chinchilla but in those pre-internet days it was not easy to find one and January was not a good time of year to find kittens. However, there was a steady stream of adverts in the local paper for Burmese, so eventually she simply had to go and see some. What funny little things they were, climbing up into her hair! No way was she going home without one! Wow! That gorgeous silver shaded colouring and no grooming! Inevitably, Liz succumbed, but first she wanted some Burmese, and she wanted to show Henrietta. So it was almost three years before Henrietta made the acquaintance of Summaglo Silver Solo, a first generation Burmilla. Predictably the outcome was an entirely happy one, for all parties, and the first Huggibear Asians were born in February 1995, and what a wonderful litter that foundation litter was! 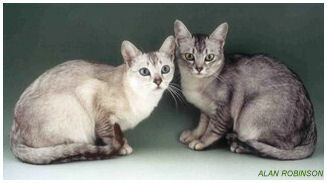 It included Huggibear Woodsmoke (left) who went to a friend where he lived as a pet but helped the breed to gain championship status, Sandy (Ch Huggibear Silversand) (below left) and Hannah (Huggibear Silver Serenade who won Best of Breed at the 1995 Supreme Show beating another cat who was to become a very famous name in Asian circles) - below right. Unfortunately after gaining two CCs Hannah got a bald spot on her ear which never completely disappeared and the GCCF's paranoia about ringworm meant that Liz never showed her again. She has regretted that even to this day. Even more unfortunately Hannah never successfully produced a litter despite several attempts. 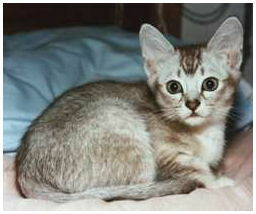 The fourth kitten in the litter Huggibear Moonlight Sonata (Gemma) was not show quality and was not shown, but she did prove to be a successful breeding queen, and produced several litters. (Hannah and Gemma are pictured on the right with Gemma looking to the right and Hannah to the left.) Sandy was used as a stud cat until he was ten years old but his wonderful temperament meant that he was always first and foremost Liz’s pet. 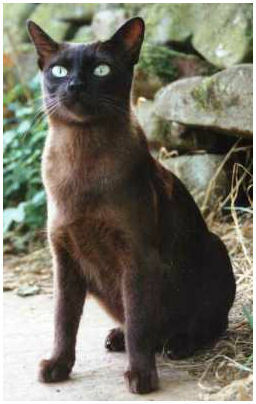 He died of kidney failure at the age of 11, the last survivor of that foundation litter, and is sorely missed to this day. But even he is not missed as much as Henrietta. That foundation litter was second generation (1/4 Chinchilla, 3/4 Burmese) and in fact Liz never got beyond the third generation because tragically just at the point where the third generation should have become well established she had an almost total wipe-out of her breeding lines as a result of FIP or some other cause which was not diagnosed. However, they say every cloud has a silver lining and in fact it was a direct result of the FIP that Liz ended up marrying David. Liz had only just got connected to the internet (January 2001) but Naomi Johnson, who was already very experienced with the internet, suggested to her that she might try eGroups where there were discussion groups dedicated to veterinary problems. At that time, being desperate for some kind of solace, Liz naturally looked for other groups she was interested in and so it was that she ended up on a Christian/Muslim debate list where she met David (who is NOT a Muslim!) So, Naomi, it’s all your fault!! Liz and David married in October 2001, but it was not until 2008 that Liz felt sufficiently confident to return to breeding. Only one of the original lines still existed. The restart involved the daughter and granddaughter of Sandy and we also brought in three new cats. We were very fortunate in being able to obtain a working stud to replace the now deceased Sandy and the first Huggibear litter after the long gap was born on 13th May 2008. The story continues here.